This mock examination allows you to simulate the telc Schreiben und Lesen Basis 4 exam under realistic test-taking conditions. It also includes information on the test procedure, the type of tasks that can be expected to appear on the real exam, and assessment criteria. The classroom package includes everything you need to test five course participants. 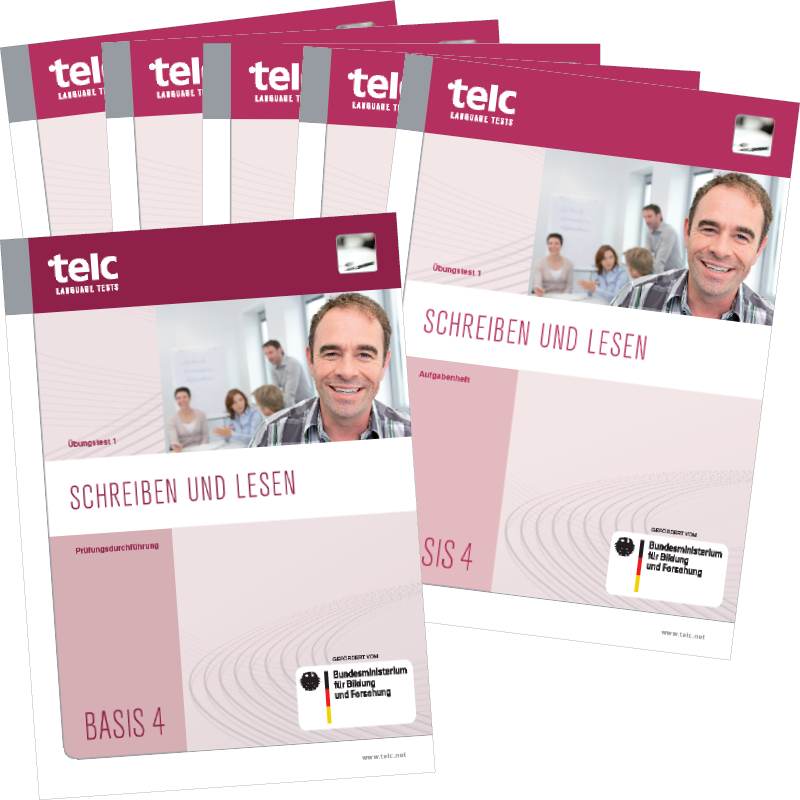 Whether exam candidate, teacher or examiner, the mock examination will help you understand all aspects of the telc Schreiben und Lesen Basis 4 exam. Included in the booklet are information on the test procedure and a complete mock examination with answer key. Lower level interim tests are ideally suited to introduce your students to the test situation and to gradually strengthen their proficiency to the level they will eventually encounter on the real exam (lea.-Diagnostik, Alpha-Level 4). The student’s booklet includes tasks that candidates can expect to encounter on the real exam. The mock examination cannot be administered without a copy of the examiner’s booklet. The booklet includes: a full mock examination with answer key, instructions on how to run the test, and an overview of the exam format, (the number and type of tasks, timing, scoring as well as the weighting each part carries in the final grade). There is also a description of the assessment criteria used to evaluate candidate performance for the Writing subtest. The exams focusing on “Geriatric Care” and “Industrial work” are aimed specifically at literacy students who want to work or are currently working in these sectors. These exams follow the same structure and test the same reading and writing skills as the general exam that does not focus on vocational domains.